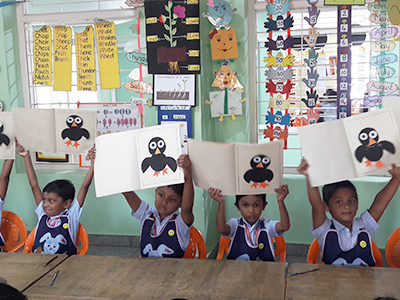 Students of UKG & M2 identified names of body parts and put them together to create a cute little crow. Refining their fine motor skills, students enjoyed the adventure of finding the right parts and gluing them together. 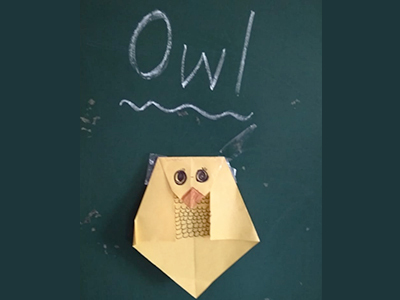 Students of M1 were introduced to the art of Origami and went on to make their very own owl! 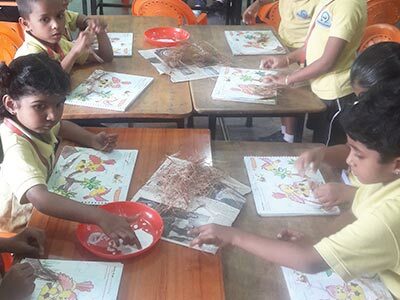 The activity is ideal to develop eye-hand coordination, mental concentration and improves their fine motor skills. It also allows children to create basic shapes of squares, rectangles and triangles with paper and has a calming effect on their mind. 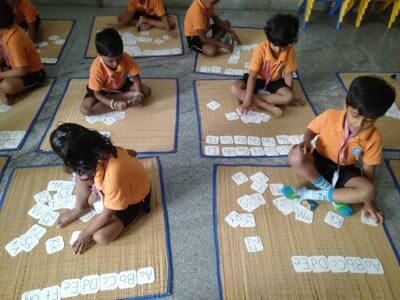 The students were able to name the alphabets and arrange the letter cards in the right sequence. 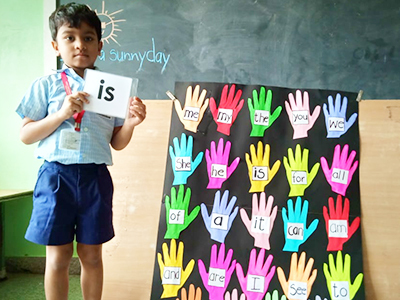 This activity builds their confidence in recognizing the letters and also helps them in writing. To enhance their tiny muscular movement, the little ones scribbled on newspapers and brought their imagination to paper in a multitude of colours. Stickers are an amazing sensory experience for children due to the nature and textures they get to experience. 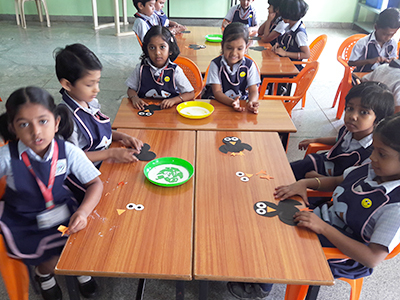 The activity involved the kids to peel off the sticker and place it appropriately, to build on their eye-hand coordination skills. 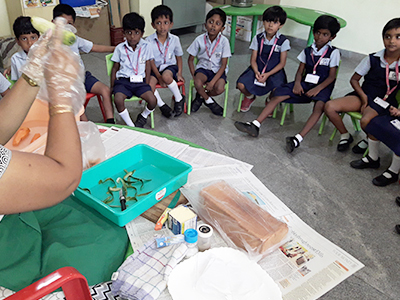 Children of Pre KG were encouraged to make colourful impressions and patters using paints and the ladies finger vegetable. In another Art and Craft activity, the kids decorated a quilt with the alphabet Q. 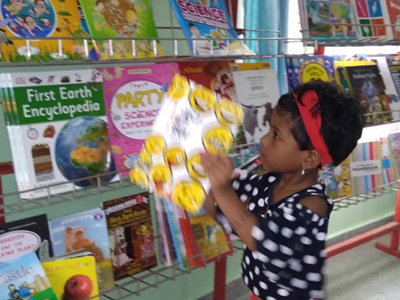 As the students of PreKG reach the end of the academic year, activities to get them thorough with basics like alphabet recognition and shape has been the theme. 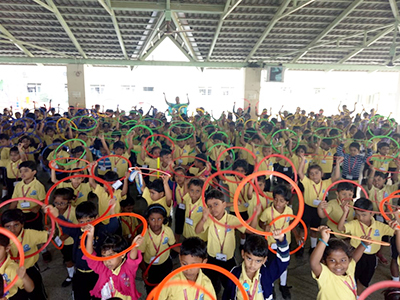 To make it a fun exercise, kids were asked to use colourful straws to trace the outline of alphabets. 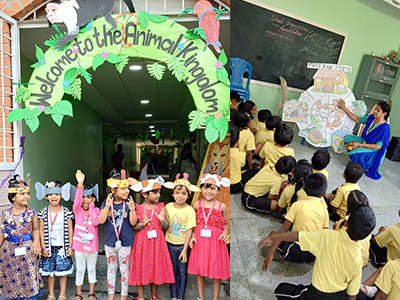 On a fine morning, students were welcomed to the campus to begin their safari to explore the majestic animal kingdom! Kids were guided to follow the footprints of animals from different habitats. Their journey was punctuated with fun-filled activities like Dark Adventure Zone, Zootopia and other unique puzzle games. A superlative day that culminated with kids receiving handmade crowns as their cherished take away! Students made an enthusiastic return to school following their winter break. 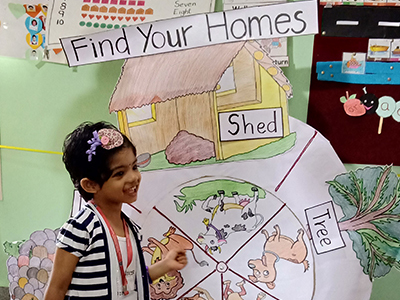 Children were welcomed with new charts and classroom props! 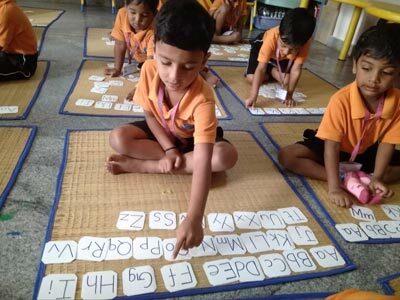 The children are given an opportunity to identify words from the clue chits and match it to the chart of Sight words. A fun way to improve their vocabulary. A playful way to get thorough with alphabets by means of letter recognition and matching lowercase to uppercase alphabets. The activity is one of the most effective ways to help children with pre-reading and pre-writing skills. 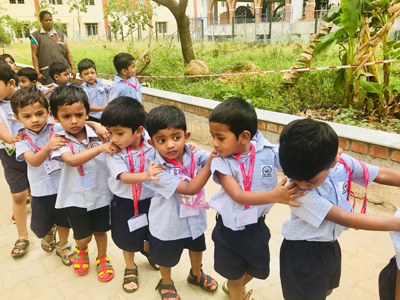 KG block is gearing up with the preparations for Sports Day, to be held on 10th Jan. Students of UKG and M2 are enjoying preparing for their big day! 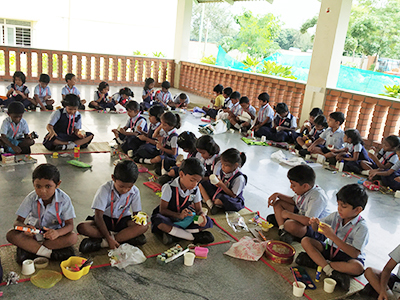 Children were explained about coconut husk and even had a fun group activity with it! 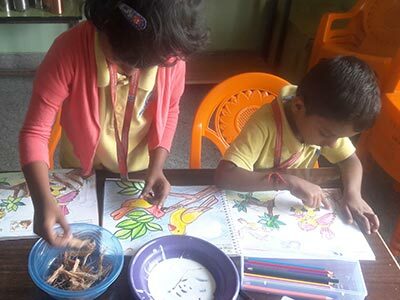 Children used the coconut husk to make a nest while sticking the on paper and used crayons to complete their creation. 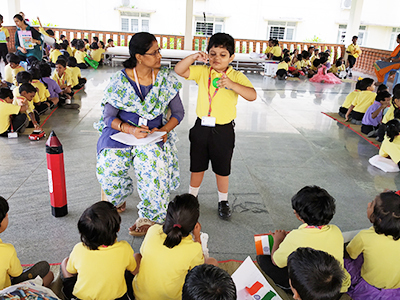 As part of the Bunny activity, children were explained about our tri coloured national flag and the significance of Republic Day. 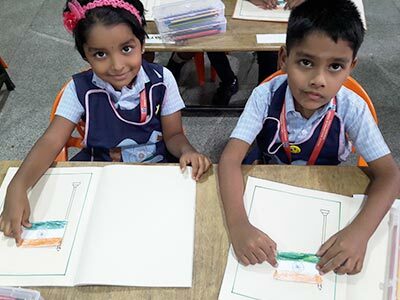 The kids drew a flag on a sheet of paper and enjoyed their colouring activity. 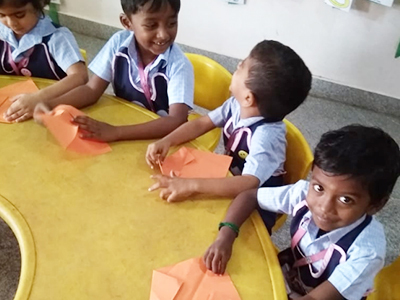 While exploring concepts of transportation, specifically air transport, children were introduced to spaceships and went on to proceed with an activity of drawing a spaceship step-by-step. Field trip! 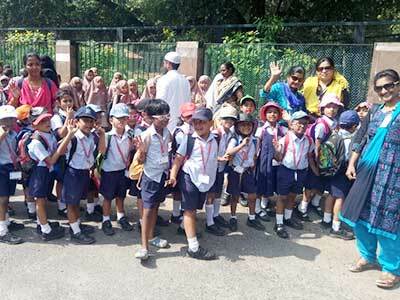 Our UKG & M2 kids were taken on their first ever field trip from school to the Guindy Park and reported to school in full gear – hats, waterbottles and a picnic bag! The day was an adventurous one and all of them were beaming with stories about everything that they had seen at the Park. 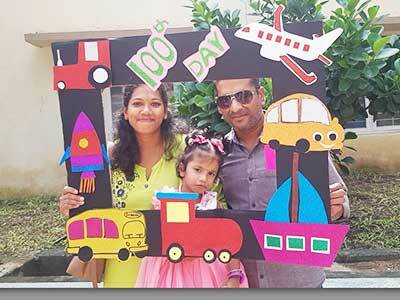 Kids of Pre KG celebrated 100 days of schooling in a vibrant way! The KG Mandap was occupied by midgets and kids were ecstatic as they witnessed their favourite midget dancing away! The photoboth was yet another star attraction and it was selfie-galore! A fun day for both parents and children, who were also given a special take away of cookies. 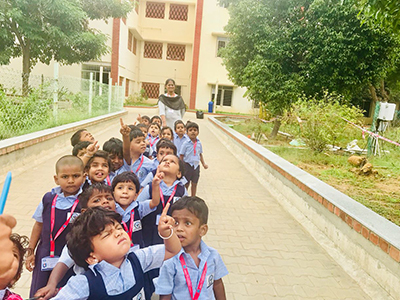 It was the turn for our LKG students to go on a fun adventure! 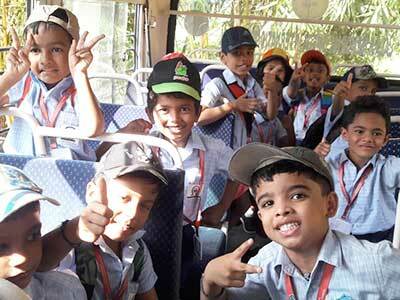 Our young ones had a grand time travelling in the school bus and taking in the sights and sounds of the city! A memorable day exploring with their friends! Yet another fun activity was planned with play dough. A simple activity that promotes learning and development through hands-on playing exercise. 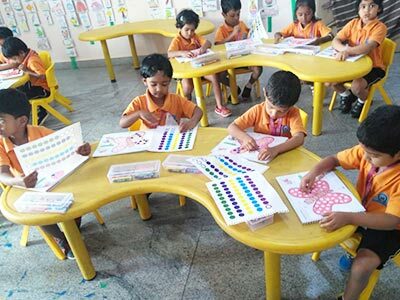 Rainbow tracing is the activity where children trace an alphabet using seven different colours. 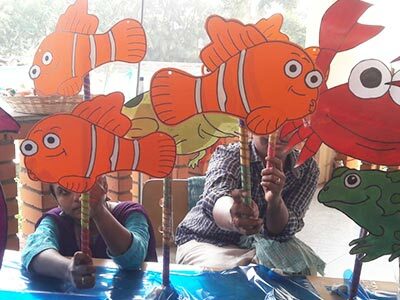 A vibrant project that helps children develop their fine motor skills and eye-hand coordination. 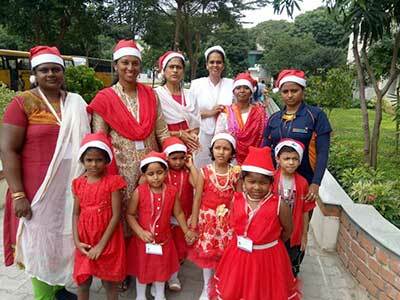 As part of the activities of the Bunny program, students were given a cut out of their beloved Santa. Children enjoyed colouring the cap and sticking cotton for Santa’s beard! The last working day before the winter break was all about celebration and spreading Christmas cheer! 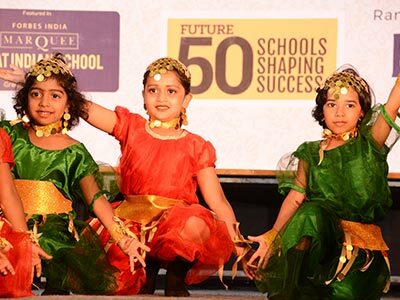 The KG Mandap was vibrant with dance performances by UKG and M2 kids along with joyful renditions of festive carols! The children were ecstatic with Santa’s arrival and were overjoyed to receive their takeaways! 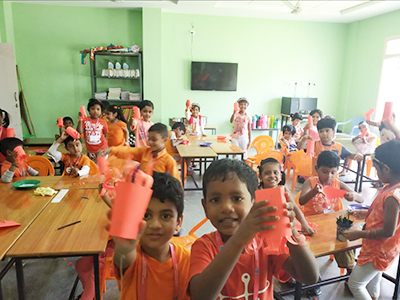 The week saw a flurry of fun activities for our young ones in UKG and M2 in anticipation to Childrens Day celebration the next week. There was Paper Cup Art, Show and Tell activity and a Colouring activity. 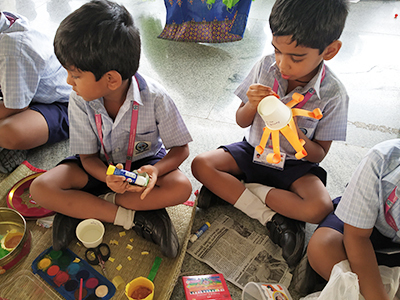 Paper cup activity showcased the children’s creativity and imagination; for paper cups were transformed to animals, fun objects and beyond! Show and Tell activity laid the focus on confident orators and was indeed lovely to watch the little ones speak exceedingly well. 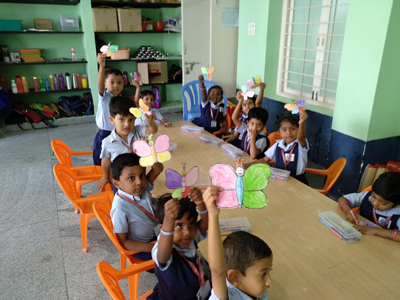 The colouring activity brought to life beautiful and colourful butterflies! 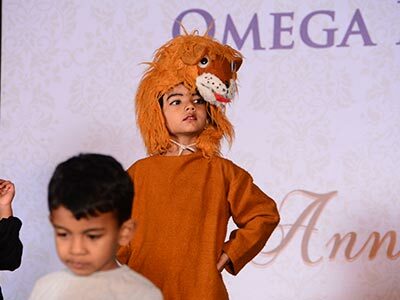 Childrens Day celebration with our young ones took centre stage all week long! 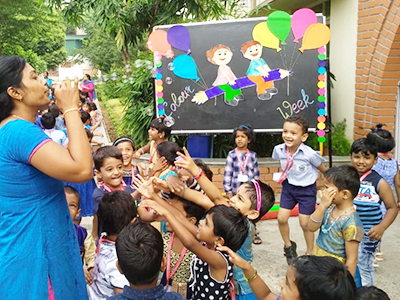 With a host of merry activities, our teachers and support staff planned their special day meticulously and a one full of surprises. 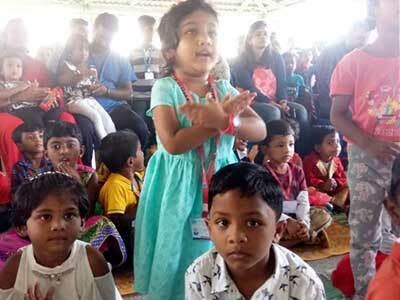 On 14th, children walked into the campus bright and chirpy in their colourful clothing and were welcomed with the music of their favourite cartoon characters. 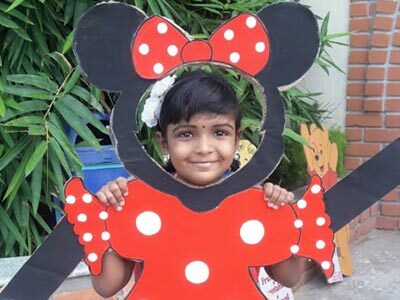 Parents and kids made a bee line to click a picture with cut-outs of special Disney characters and the Kindergartners were then all set to experience more surprises inside their classrooms. Colourful confetti and a special take-away for the kids was all part of the day’s jubilant celebration. 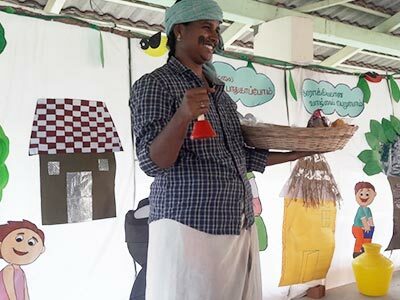 Teachers and support staff also distributed the kids’ favourite chocolates and put up a fun skit with props and more at the specially decorated Mandapam. A memorable day not only for the children but for everyone involved; happy Childrens Day indeed! Pattern is the concept of repeated design or recurring sequence in a structured manner, with numbers, shapes, colours or with actions. 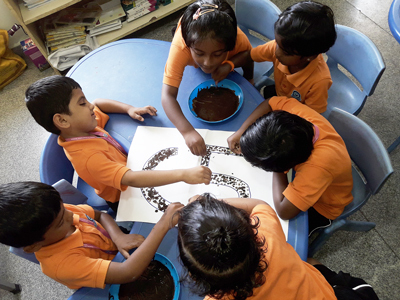 Children of UKG were given an opportunity to create patterns using colourful dried ingredients. 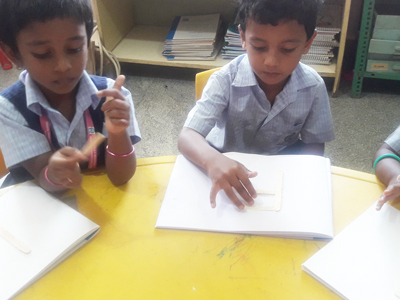 This helped them to enhance their thinking ability and observational skills while enjoying the activity of completing patterns. M1 children explored the world of shapes by walking over them! 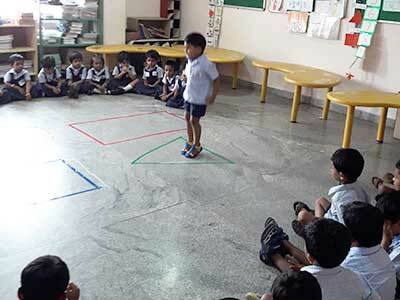 This activity helped them in recognizing the various shapes not only at school but also while outdoors. 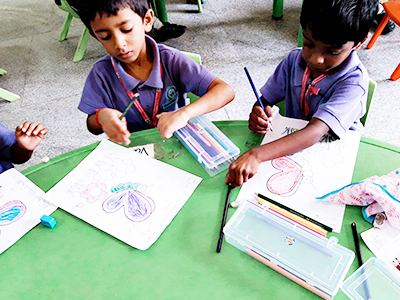 The artistic representations of the shapes sure made the activity an enjoyable experience! Clay is versatile and fun for kids to play and experiment with. To explore mathematical skills, children made several clay balls and arranged them on slates next to its corresponding number. Children rolled clay to make a long rope and further cut them to make small pieces. Next, they attached the pieces together carefully to create the alphabet ‘M’. Children plunged into action, rolled the dice, jumped on the squares and climbed the ladder happily and also slid down with laughter. Our Kindergartners were absolutely thrilled when they reached the finishing point! 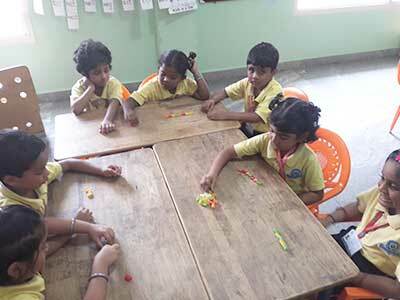 Through this activity children learn all about strategy skills, mathematical skills, team work, colour recognition and also helps them to develop social skills. Colour week in the KG block was scheduled between October 22nd to 26th . The entire block looked vibrant with children, parents, teachers as well as caretakers moving about in colourful clothing. 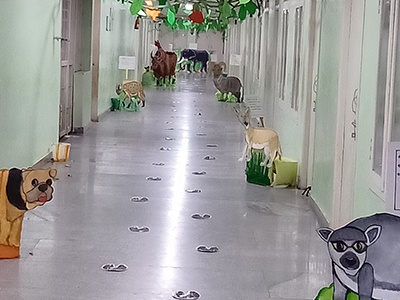 The KG corridor looked peppy with thematic props and more. Colourful ribbons welcomed children each morning and were pleased to return home with their handmade creations; Green crown, Red photo frame, Orange wand, blue fan, yellow giraffe, etc. Children also had a good dose of “Bubble Bash”, popping bubbles in the sun while reflecting rainbow colours! 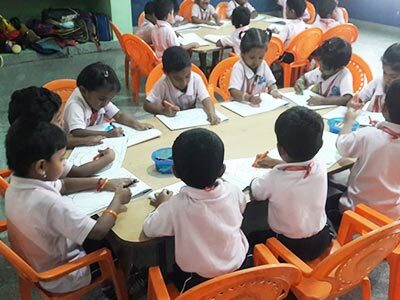 The tiny tots were exposed to a fun alternative method of writing. 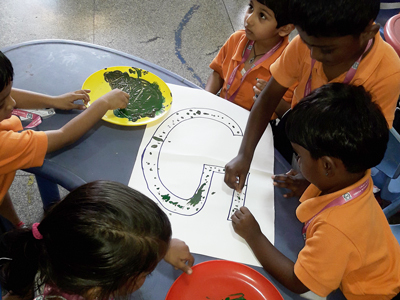 They painted the letter Gg on the chart paper using flower buds. 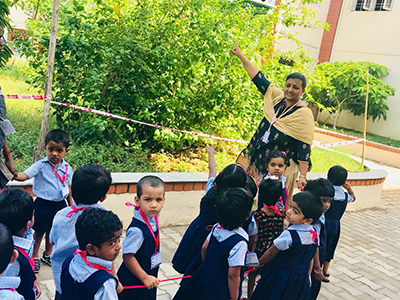 To experience nature, children were taken on a walk around the campus. 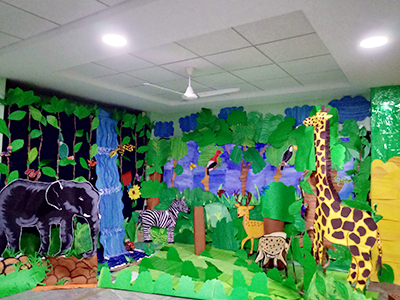 This helped the kids relate to concepts that they learn within the classroom – big/small, tall/short, colours and more. Our UKG kids worked on a special project titled “Jobs People Do”. 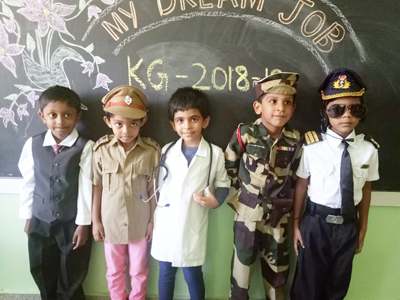 The kids envisioned their dream job and spoke a few lines while being dressed in an appropriate costume depicting the profession. 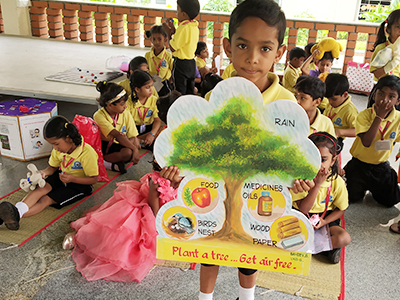 The block was abuzz with “When I grow up, I want to be a …..”! Festivals play a vital role in community celebrations. 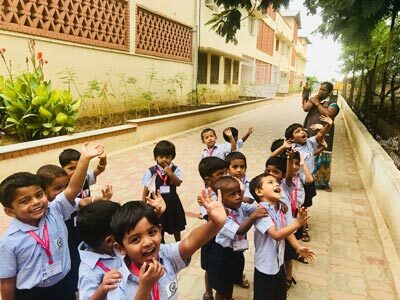 Ganesh Chathurthy is one such festival welcomed by all especially our Kindergarteners. 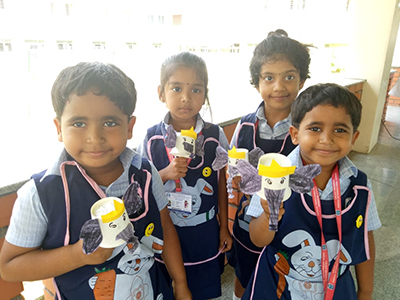 This year the children celebrated the festival by making tiny versions of Lord Ganesh using paper cups and icecream sticks and proudly carried them home! 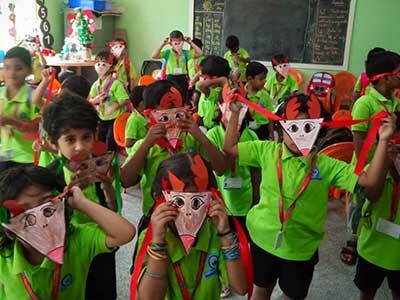 This fun filled activity started with the emphasis on a number of aspects. 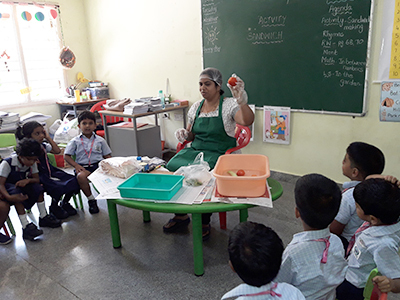 First was about cleanliness – by washing the vegetables, followed by safety measures in handling sharp objects and ending with the awareness of eating a healthy snack. It was a treat for the eyes and feast for the stomach! 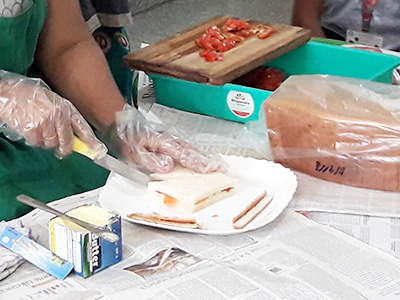 Children ate the scrumptious sandwiches happily and left with an understanding that healthy snacks can be delicious too! 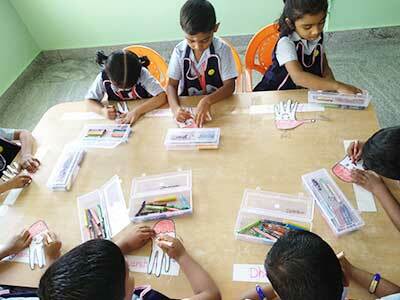 The tiny tots were exposed to a fun alternative method of writing. 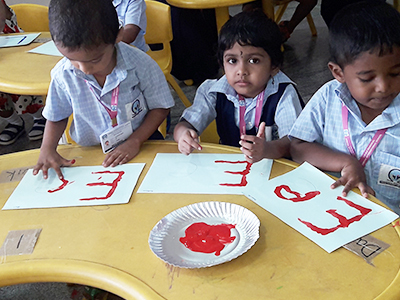 They painted the letter ‘Ee’ on the chart paper using different colours and their fingers. This pre-writing activity, apart from helping them to develop their fine motor skills, reinforces letter recognition and letter sound. 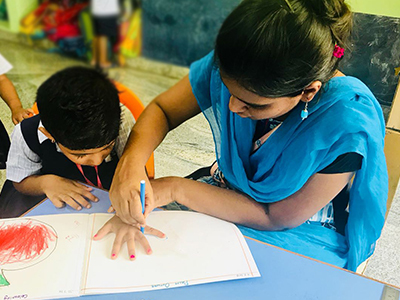 The child and the teacher imprinted the outline of their palms in their Art and Craft Notebook to be aware of the concept of Big and Small. 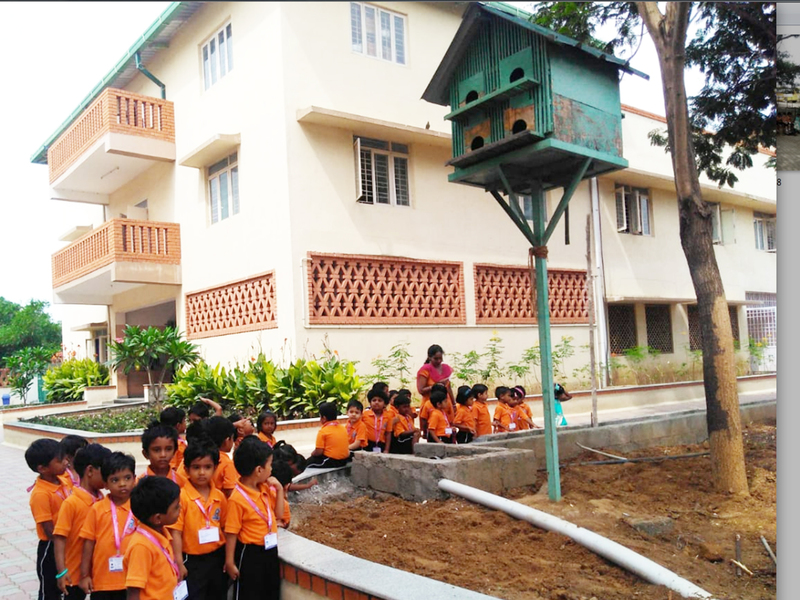 The children were taken around to experience the greenery within our school campus. They seemed to have enjoyed exploring the beauty of nature – trees and leaves ( big/small, tall/short), bird’s nest, butterflies and worms. They also met the gardeners and were explained their role as caretakers. 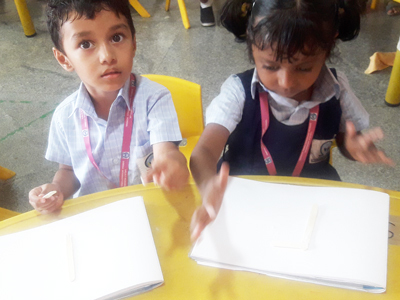 A fun filled activity for children was conducted by encouraging them to arrange their favourite ice cream sticks for the letter Ff. 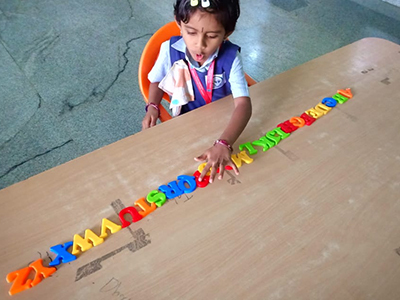 This activity helped the kids to focus on letter recognition, sound & the formation of the alphabet Ff. 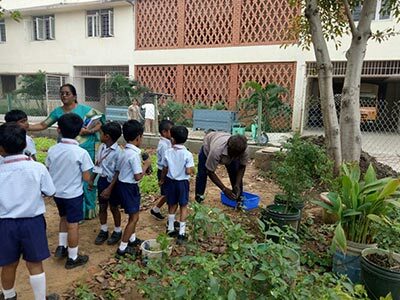 Children explored the green campus at Omega on a pleasant morning during the week. 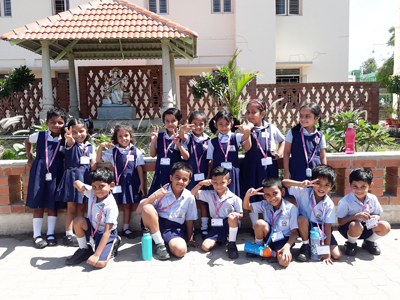 They admired the magnificent gardens, observed a variety of plants and trees and were fascinated with the beauty of colourful flowers and butterflies. 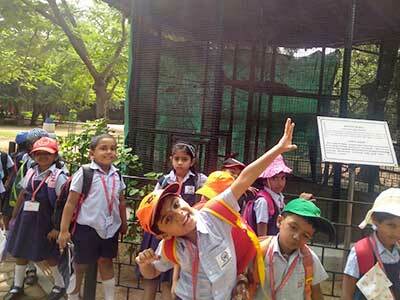 The children were also captivated with the different kinds of fish and enjoyed watching the pigeons perched on trees. It was a feast for their eyes and left them refreshed in the body, mind and soul! The first open day for the academic year 2018-19 was held on 1st of September. Parents participated enthusiastically to know about their child’s performance in school. 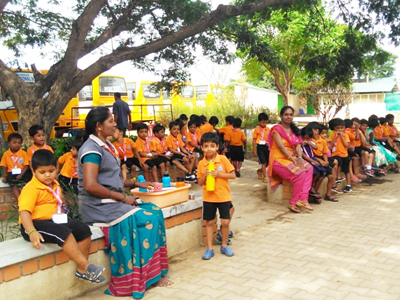 After meeting the Teachers the parents had an opportunity to take part in an Orientation program from Edusports. Parents and children enjoyed participating in the various games and circuits. The Scholastic book stall and Omega Paper Plant stall were also visited by one and all. 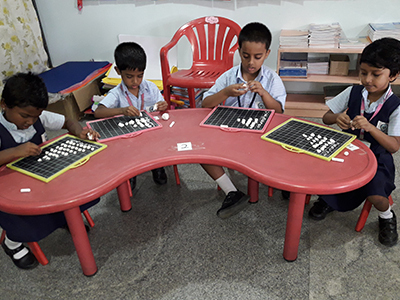 Our M1 students were introduced to a very fun activity this week – Arranging Beads on the Alphabet. The alphabet of choice was ‘B’ and students arranged colourful beads on the letter. A group activity that was thoroughly enjoyed by one and all! 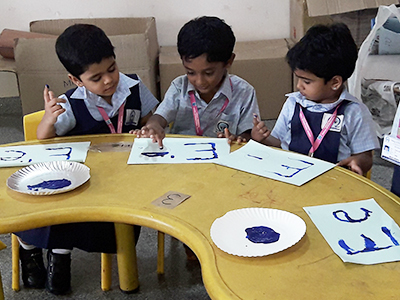 Students of LKG were introduced to an easy alphabet learning activity involving finger printing. It’s a great way to get our children more familiar with writing letters of the alphabets and develop fine motor skills. 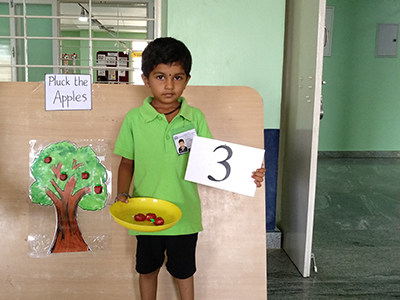 The Apple Tree Activity is all about number recognition, counting and one-to-one correspondence; where the child will pluck the apples as per the number printed on the card. 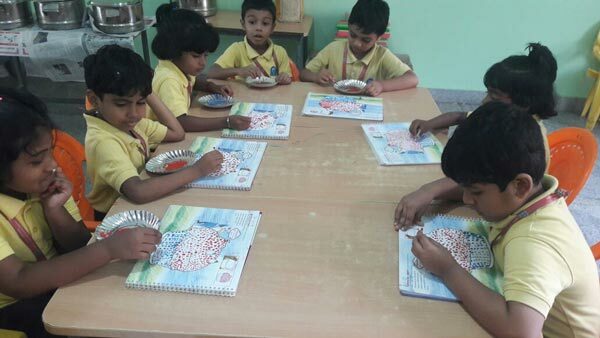 Children also explored dot art activity and printing with cotton swabs instead of using a regular paintbrush. 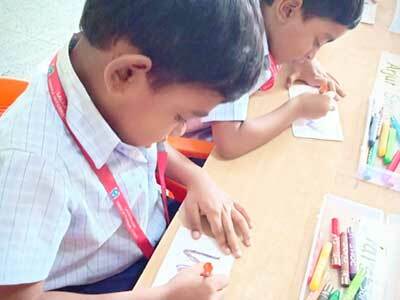 Rainbow Trace Activity is another enjoyable classroom activity for learning about the alphabets. 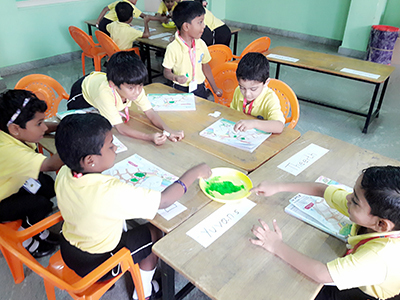 Children trace the alphabets with different colour crayons. 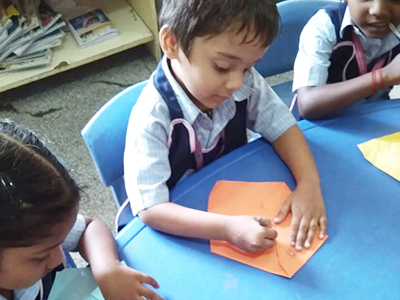 This week was all about writing activities for our young ones to develop their fine motor skills. 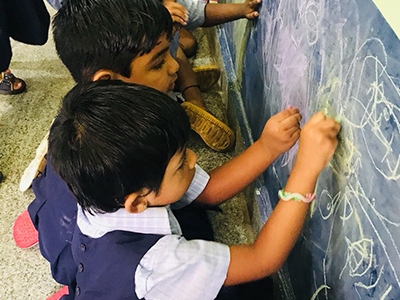 Teachers encouraged the students to scribble with crayons and chalk pieces on paper and black board. The kids seem to enjoy being given a free hand to scribble away! 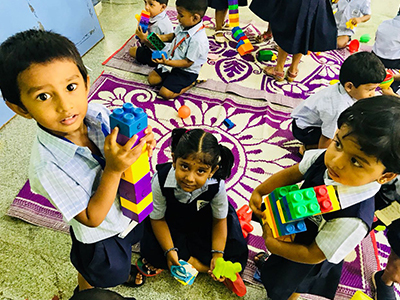 Another activity that helps to develop fine motor skills and improve their hand-eye coordination is playing and constructing with building blocks, and that’s exactly what our students did! 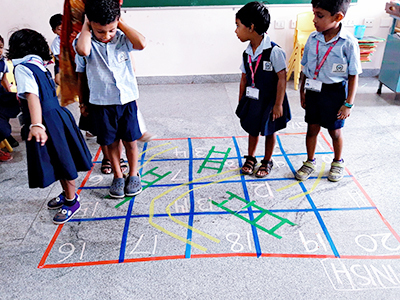 An activity where the children come in an orderly fashion to trace the alphabets on the wall, as per instructions being given by their teacher. It was lovely to see kids wait for their turn and cheer each other to trace well. A great exercise to help them learn the formation of letters! 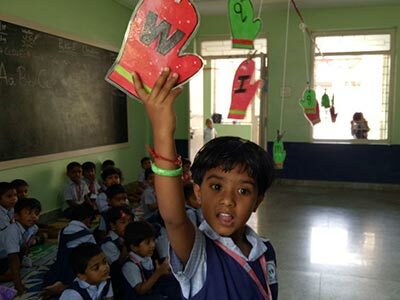 Learning is fun when it is done in a playful method! 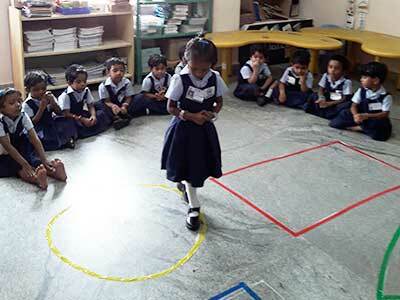 Students of M1 had a wonderful activity of walking on the alphabet ‘Cc’. 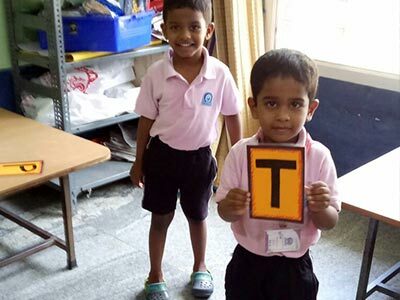 Children participated enthusiastically and were able to identify the name of letter and say the sound with confidence. 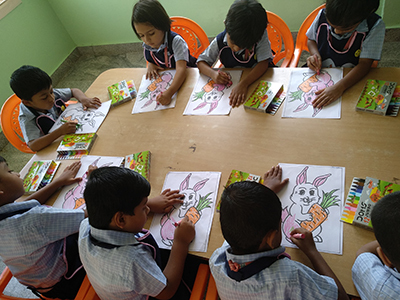 This activity helps children to know about the bunny program through a colouring activity. 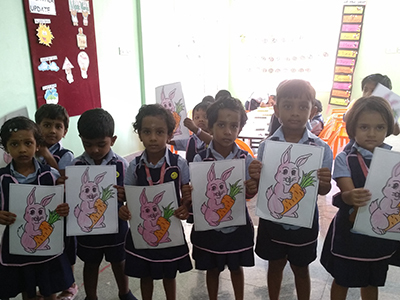 Children coloured the pink long ears, bushy tail and bunnies’ favourite food, the crunchy carrot. 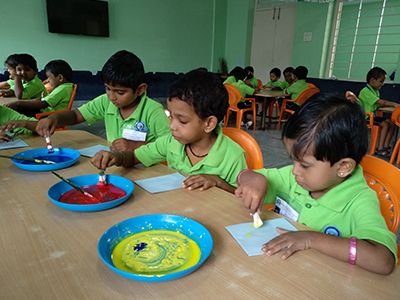 Students used little cotton balls to dip in water colours and made impressions on a picture of a tortoise. This activity helped children to learn to colour within the boundary. 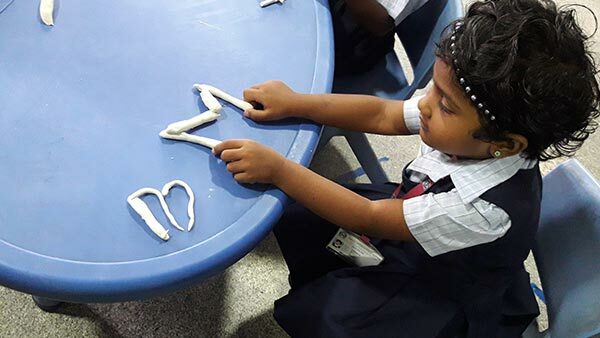 Children were engaged in hands on letter activity. They sorted pictures for the corresponding alphabets. 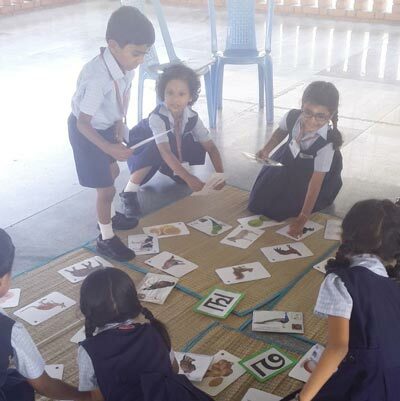 It was wonderful to see every child make an effort to sort the pictures thereby enhancing their literacy vocabulary. 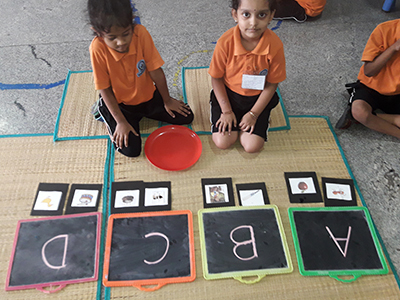 Children sorted pictures by their initial sounds into trays labelled with the letters of the alphabet. 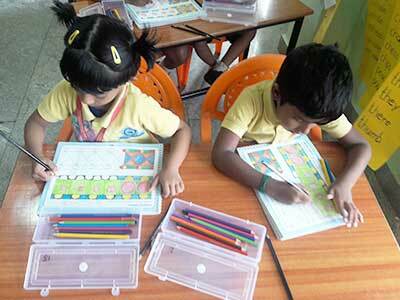 Children checked the pictures for initial sound and sorted it into the tray as a group activity. Sorting activity is an excellent way to reinforce phonic awareness skills and other early literacy skills needed for reading. 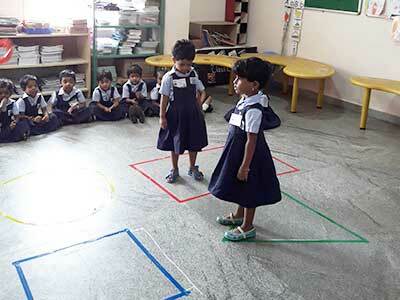 Children learnt letters and their corresponding sounds through a fun and active jumping game. 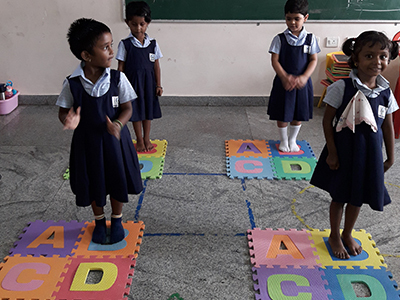 Children were able to identify and recognize the letters and enunciated the sounds for the letters by jumping on letter mats. Kids love learning math when they can use their hands and fingers. 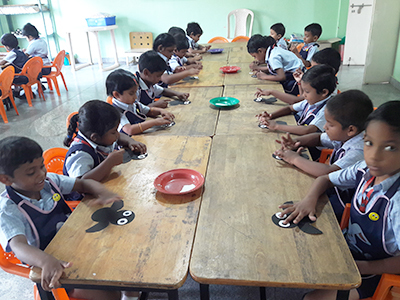 Children had a math activity where they had to roll the clay into balls and write the number and count the balls as per the number and present them neatly on a slate. 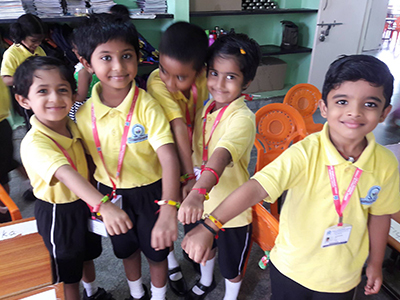 The children of kindergarten were given an opportunity to create their own friendship bands using colourful namkeens. 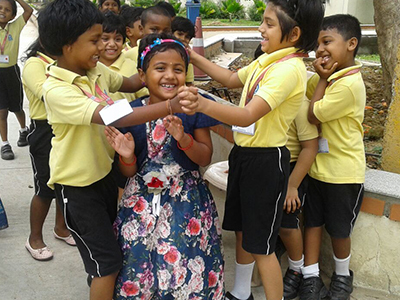 It was indeed enjoyable to see the little hands string through colourful namkeens and tie them on their friend’s wrists. Children discussed with their teachers about the importance of love and friendship. Hide and Seek is an evergreen game, loved by one and all and during the week we introduced the game to our kids, but with Alphabets. 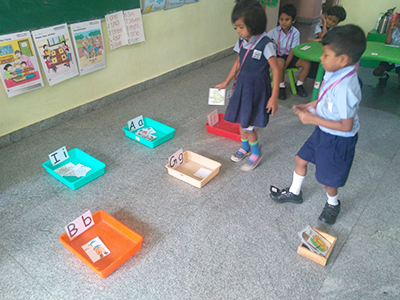 Alphabets were randomly hid at various locations and the children were given instructions to look for them in locations like under the table, near the window, inside the box, etc which paved way for them to understand positional vocabulary too. 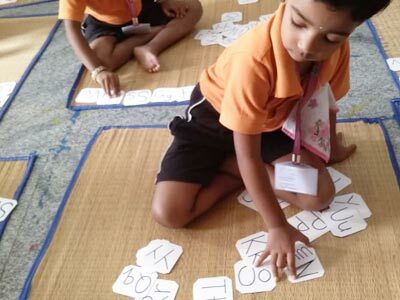 Once the children found the alphabets, they were encouraged to identify its corresponding sound. 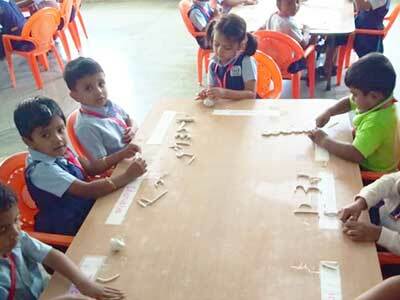 Various alphabets were suspended from a long string across the classroom. The children were instructed to give hi-five to the called out alphabet. 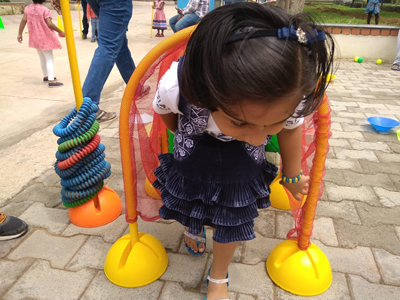 The teachers also added innovation to the game by changing the height of the strings to make the children jump and reach for it! 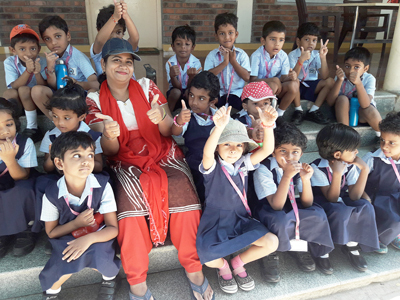 The Pre Kg children were taken to the Mandapam for a rhymes session where all the old rhymes were sung. The session got interesting when there were special requests by the children! 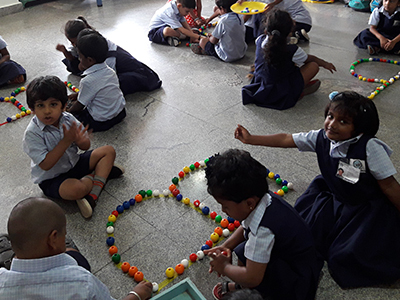 Being the final week of the year, a variety of activities were planned for the children of Pre KG, including making an octopus’s tentacles, pattern drawing, wax resistance, passing alphabet, number line and so on. Edu sports : The Edu Sports department recognised a few children as Sportsperson of the Year and certificates were awarded to them. 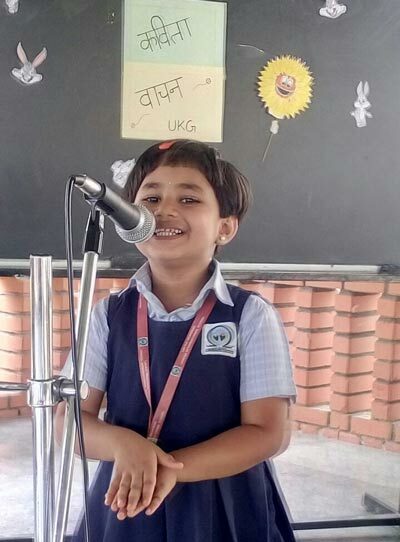 Rhymes competition : The Hindi department conducted rhymes competition for the children and the prizes were awarded during the morning assembly by the Headmistress. 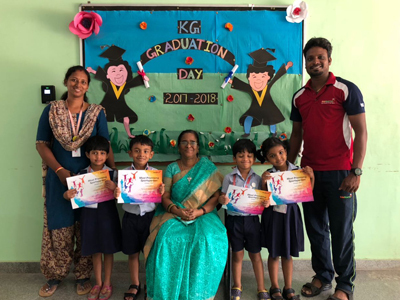 Rhapsody arranged a summer camp for the KG children in the Mandapam, where the children were taught new songs and new activities each day. 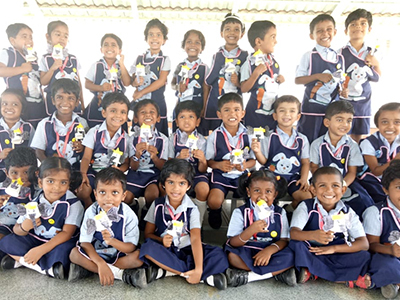 The language department gave away small Ice cream stick animals as a take away for the children of UKG and colourful butterflies to the children of LKG. The last working day was made a memorable one for the children! 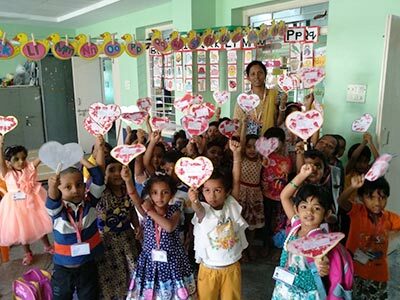 The children played a lot of games inside and outside the class rooms and even enjoyed in a dance party! With that the academic year of 2017-18 draws to a close. Happy holidays! 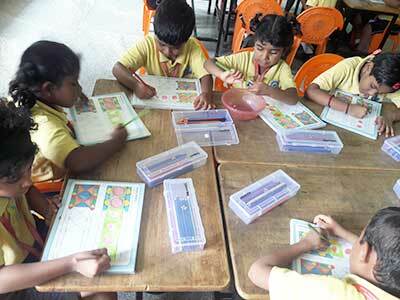 We have commenced assessments for students of Pre KG, LKG, UKG, M1 and M2. 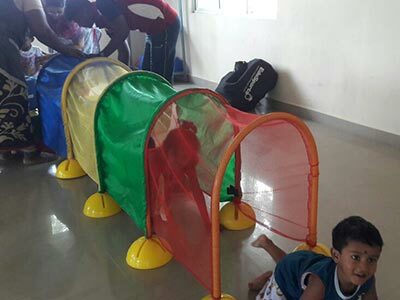 For students of Playschool, we conducted an “Under the Tunnel” activity. 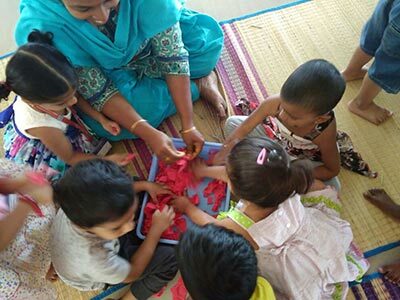 After working on their Fine Motor Skills, this activity helps to develop gross motor skills for the young ones. 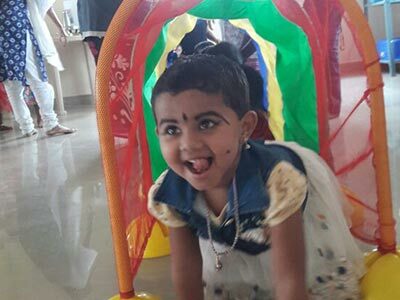 An ideal example of learning while having fun! 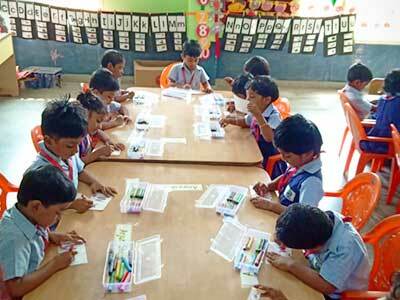 The Tamil teachers conducted a competition on sorting of pictures and letters for the children. 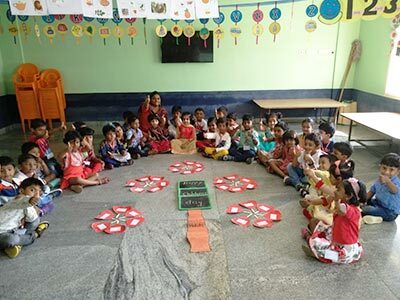 Pictures of Wild Animals, Pet Animals, Birds, Flowers, Letters were randomly spread on the floor and the children were instructed to sort and group them. Another competition, this time about singing all the Hindi rhymes learnt during the year for UKG children. 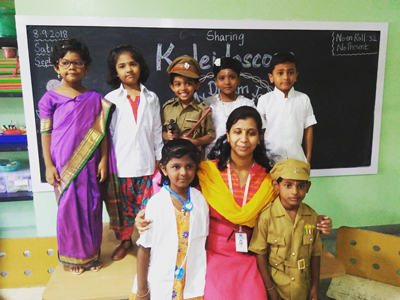 Bunny All Faith Day: Bunny Tamtola, the last and final Bunny class for the academic year of 2017-18 was held on the 14th of March 2018. The class was led by Mr.Nagesh, our Scouts and Guides Master. The highlight of the day was when the bunnies sang all the songs that they learnt throughout the year. The session ended with the All Faith Prayer by three children representing the three religions. Cotton Swab activity: As part of the Art and Craft class, cotton swab activity was done by students of UKG. 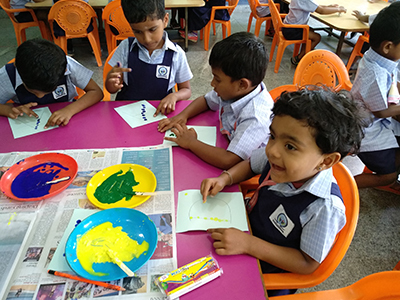 Right from mixing the paint to executing the work on paper, the entire activity was enthusiastically completed by the kids, with ample guidance from their teachers. Prize distribution: Prizes were distributed to the students by Mr. Bala (Facilitator – Dept. 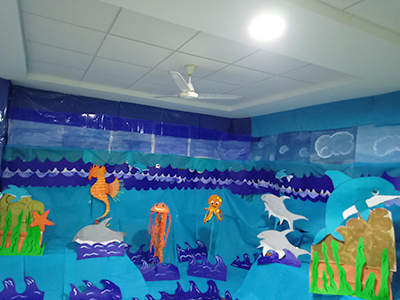 of Arts) for competitions conducted during the year – Clay modelling, Tamil Rhymes Recitation and Paper Collage. 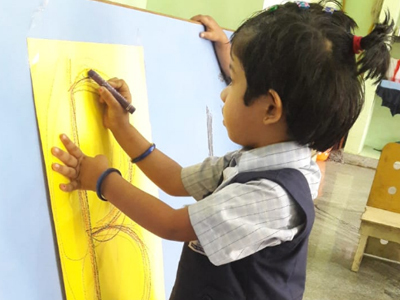 Open Day take away activity: Scribbling is the most enjoyed activity in Pre KG classrooms. The children were allowed to scribble on charts which was then remodeled as a pouch for crayons. The same was handed over to the children on the Open Day along with other art and craft work done by them. 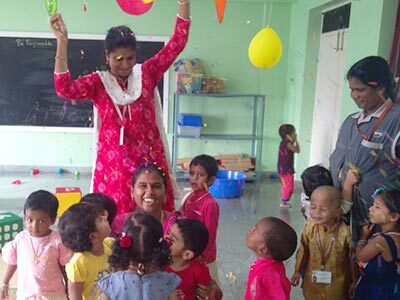 Play School graduation: The playschool children graduated from their current class with a grand smile. The proud parents carried home their little ones adorning graduation caps! 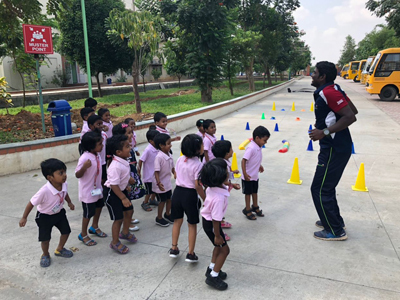 Edu Sports activity: The Edu Sports team conducted various interesting activities for the children who ran excitedly without minding the morning sun. It was time for the annual Class photograph session. 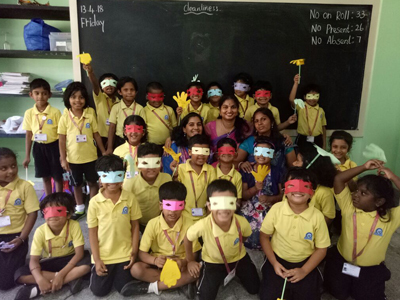 All the students were lined up with their teachers and displayed their best smiles for the camera! Annual day practice – With the d-day soon approaching, it was time for all the kids to perfect their dance moves! The annual day practice has become a part of our routine and would continue till the 22nd and 23rd of Feb 2018. The young ones are getting confident with their dance movements and cant seem to contain their excitement to perform on stage very soon! 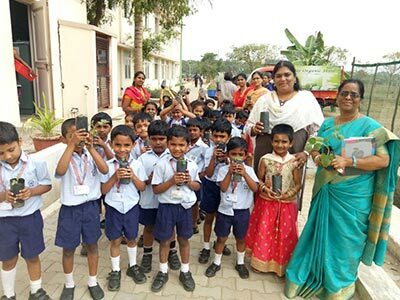 Parents of Sri Harini of UKG – G presented medicinal saplings for children and KG teachers. 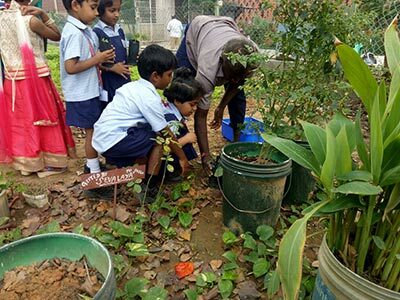 We have embraced this loving gesture by planting the saplings in our garden. The birthday of Lord. Baden Powell, the founder of The Scouts and Guides movement, was celebrated as Thinking Day on the 22nd of February 2018. All the trained Bunny and Cubs & Bulbul leaders assembled in the Mandapam. The Mandapam was all set for the Prayer with floral decorations depicting the various religious symbols, done by the KG staff. 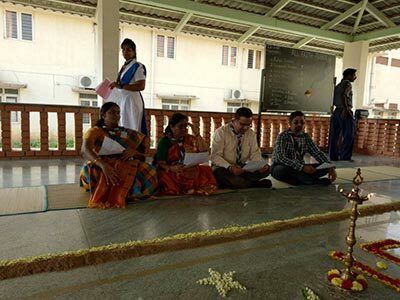 The program started with a speech by our Group Leader Ms.Kalaivani Suresh followed by a prayer. 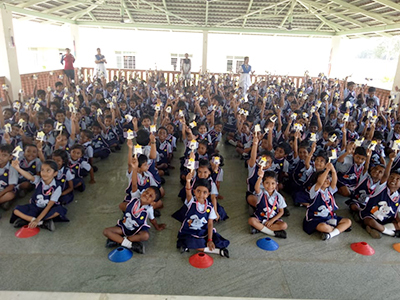 Verses and songs prescribed by the Bharath Scouts and Guides National Headquarters were recited by leaders representing various faiths; Christianity, Hindu, Islam and Sikh. 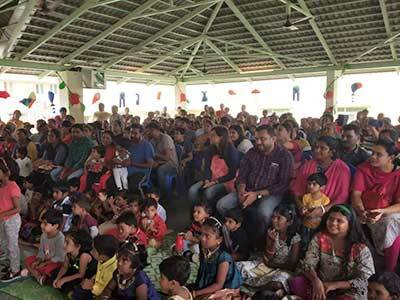 The Annual day was celebrated on the 22nd and 23rd of February 2018. 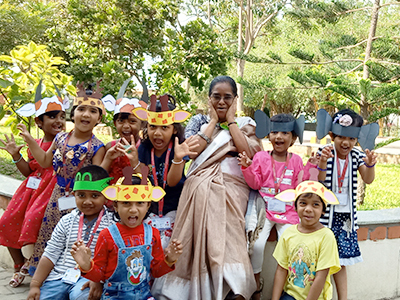 Students of Prekg and LKG celebrated the theme of ‘Grandma says…’ on 22nd Feb while the students of UKG, M1 and M2 sang, dance and made merry to the theme ’90 minutes of Globe Toddling’. 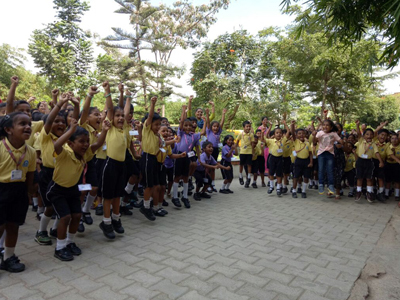 With the completion of the Annual Day celebration, students and teachers resumed their regular classes. 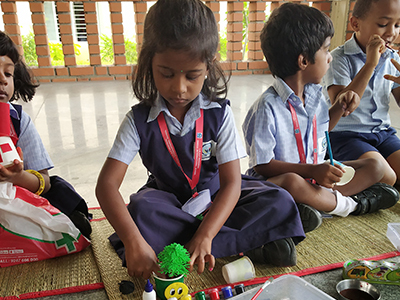 It was time to engage our Playschool students in developing their fine motor skills. This was achieved through a unique “Paper tearing” activity that was enjoyed by one and all.